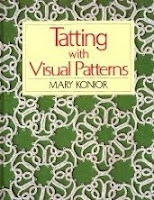 Tatting with Visual Patterns by Mary Konior is beautifully illustrated and charted. A must have for any tatter. A friend pointed out that the book seems to be out of print (I noticed a used one on Amazon for over $100!) so if you come across one, be sure to snap it up. A little tome that I often return to get ideas for those bits of thread left on my shuttle is Tatting Collage by Lindsay Rogers. Nicely charted very small projects that can used in a variety of ways... and her collages are beautiful! I have to put in a plug for probably what were the first two books on tatting I ever purchased. 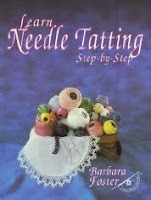 The first was Learn Needle Tatting Step By Step by Barbara Foster. Yes, in the beginning I was a needle tatter! I think I produced one of the motifs in this book about 10 times before I got it right. Although not long after my foray into needle tatting I got the hang of the flip and went completely on be a shuttle tatter, however, I am not by any means a shuttle tatting snob and I'm sure there are those of you out there who know exactly what I mean. Why is it some people get some kind of superiority kick out of knocking other's crafting ... so silly. I've seen gorgeous needle tatting and poor shuttle tatting.. it's not the tool, it's the crafter. 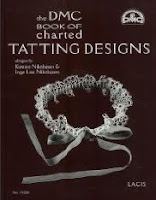 The second book I ever bought, but my first on shuttle tatting was The DMC Book of Charted Tatting Designs by Kirstine Nickolajsen and Inge Lise Nikolajsen. I still have the very first doily I tatted from this book ... what an example of uneven tension it is, but great to look at and see where I once was. I would be amiss not to mention, Easy Tatting and Celtic Tatting by Rozella Linden (aka Ruth Perry). In fact, any of her books are keepers! I've had the pleasure of being her student at several classes given at the Finger Lakes Tatting Guild's Lace Days in Hector, NY and I always learn something new. A couple books worth mention, not for their patterns, but for the information they contain about the history and art of tatting are Tatting: Technique and History by Elgiva Nicholls and The Complete Book of Tatting: Everything You Wanted to Know but Couldn't Find Out About Shuttle Lace by Rebecca Jones. Books like this offer us more in depth knowledge about this beautiful craft that's important for any hobbyist, professional or teacher. I just realized this is turning into a top ten of favorite tatting tomes! Here are the two that round out that top ten. 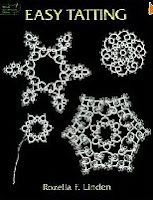 Perhaps not a book for beginners (it is well charted, but has minimal directions), but 24 Snowflakes in Tatting by Lene Bjørn is a joy. One day I will challenge myself and tat all 24 in order! My last mention today, Tatting Basic Patterns by Rosemarie Peel, is great for beginners and I believe out of print already (and it just came out in January 2009!). Again, lovely simple designs for anyone and well charted. I'm sure others have favorites too. Let me know what yours are! 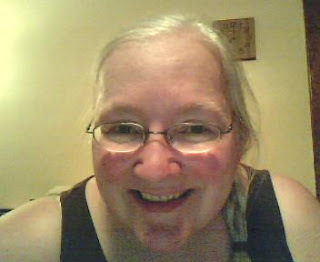 I'll take a look another time at my favorite web sites for tatting. 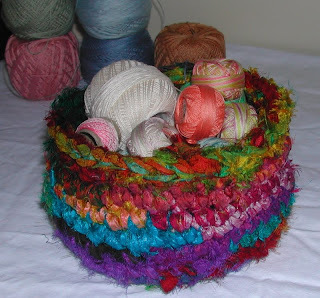 The bowl was created using a single crochet stitch with a size 8mm crochet hook. It measures approximately 13 cm (5.5") in diameter by 9 cm (3.5") in height. You know, every now and then I get really good ideas for some new fiber creation ... and on rare occasion I even impress myself with the results. Then..... it happens! A seemingly good idea goes .. well.. just kinda weird! 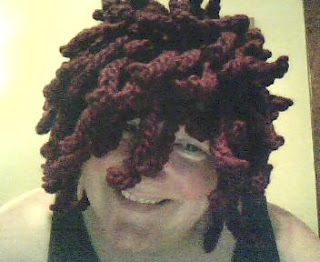 I often create crocheted hats with attached droodles or scrumbles of some kind ... this one turned out to be what my husband calls "the Annie Hat", as in little orphan Annie. And he takes great pleasure in donning it and doing his rendition of Tomorrow. I should mention he declined to be photographed wearing the hat for this entry ... the chicken! For those in the know about yarns and such, I used just over two balls of Bernat Roving in cranberry (80% acrylic, 20% wool), 10mm crochet hook .. oh yes ... it's WARM!! and ... it's HUGE!! Think what you might... I kinda like it! Ohh... I added the other pic just to let everyone know my real hair is much less cranberry colored, straighter and not at all Annie-esque. The things one can do with tatting! This general idea came from Ruth Perry at the 11th International Finger Lakes Tatting Seminars held this past April in Hector, NY. This is a stretchy hair band with tatting (all chain) attached at intervals with various beads. 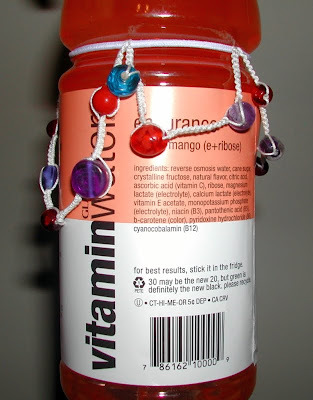 A great way to use up random beads and keep other people's lips off your bottle! 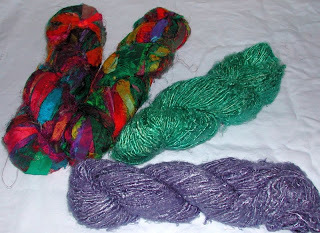 First, recycled sari silk and banana fiber from Kipuka Trading... cool! Two crochet hooks, size "U" (25mm). Designed and crafted in Ohio by John Higgins and available from BagSmith. The larger is an 18" Tunisian hook. Last but not least! 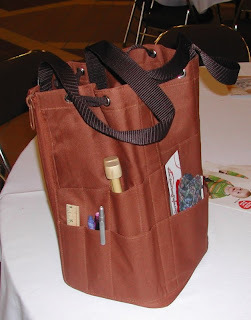 Anyone who knows me well, knows that I'm always on the lookout for (another) project bag! When I saw these I had to get one. 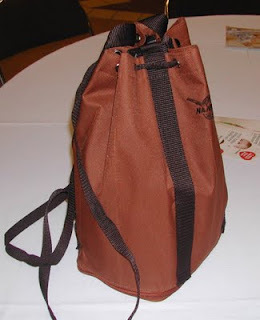 A fiber junkie's dream come true bag from Nantucket Bagg Company. All kinds of pockets all the way round. Room in the center for your project(s). The bag unzips, the pockets switch to the inside, backpack straps come out and you're on the go! One thing lacking at the marketplace, IMHO, a vendor selling lace making supplies!! Too bad the venue was not able to draw one there. There was a tatting class offered, so surely a vendor might have taken advantage of that momentum, but oh well. Would have great to see a vendor selling tatting shuttles, bobbins, pillows and shall I say it? Thread!!! OK, OK, I'm partial to tatting and think everyone wants to learn .. dont' they? My first class at Chainlink 2009 was on tapestry crochet given by Carol Ventura. Although I had pretty much worked out tapestry crochet on my own years ago there's always something new to learn! 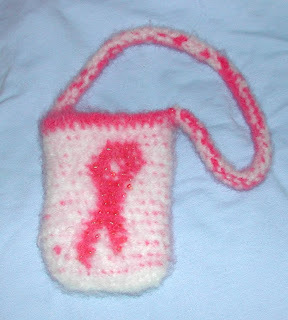 Our project in this class was to create a beaded ribbon bag (with Patons Classic Wool) which we could then felt at home. Carol also talked about designing for tapestry crochet and I got her to show me her reverse single crochet move! Now I'm ready for tapestry on the flat! If you get a chance to take a workshop by Carol, do it. 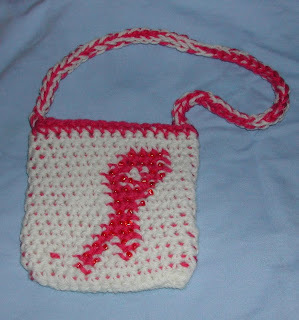 If you can't, then the next best thing is to visit her website and try a free pattern. Can't wait to start my next project in tapestry crochet! Also picked up Carol's latest book, Bead and Felted Tapestry Crochet. 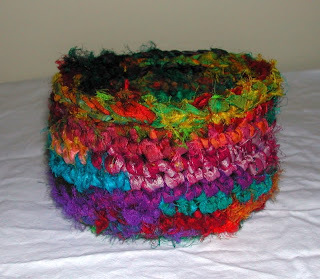 I learned to crochet and knit from my mother when I probably eight or nine years old. I never took much to knitting, but wow was crocheting those long chains fun! One of my fondest memories of crocheting ever was that big light blue ball of chains that was my first real creation! In the years since that time, I have crocheted on and off and explored other fiber arts, but in recent years I've pretty much defined myself as a shuttle tatter, although I always seem to have some crochet project going on the side.... then... I hear that CGOA's Chainlink conference will be in my own back yard, relatively speaking of course - Buffalo, NY. I had attended once before. In 2003, Chainlink was held in Chicago, my relative backyard at that time. It seemed to good to pass up! 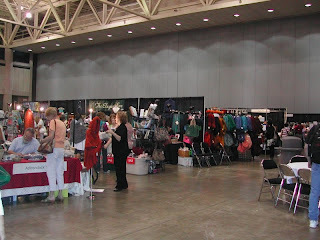 So last week I attended the 2009 Chainlink Knit and Crochet Show in Buffalo, NY. I signed up for the Professional Development Day, took four classes over a three day period and had a great time! More importantly, I came back with lots of ideas for the new shop! It's really exciting to be able to geek over crochet, knitting and other fiber arts without your listener's eyes glazing over within thirty seconds! Oh, and if you believe in messages from a higher power, I got one while at Chainlink! I won two door prizes in the course of my time there. One was Donna Kooler's Encyclopedia of Knitting. I love this kind of book! Filled with swatch examples to peek the imagination, and since I don't often follow a pattern, it's a great resource for me. My other doorprize? 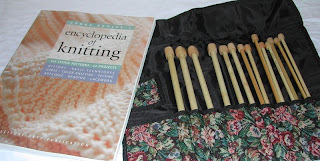 A set of Takumi bamboo knitting needles from Clover! Is there a message here? Time to hone up on my knitting skills, I think! So, as I pick up those knitting needles over the next few days (I promise I'll try not to swear as I do!) I'll be blogging about some of the things I did at Chainlink, skills learned, projects completed and ... items purchased!